Starting at 7:30, they lined up at the registration tables to get on work teams to help restore trails, build retaining walls, weed and plant, pick up trash, and more. 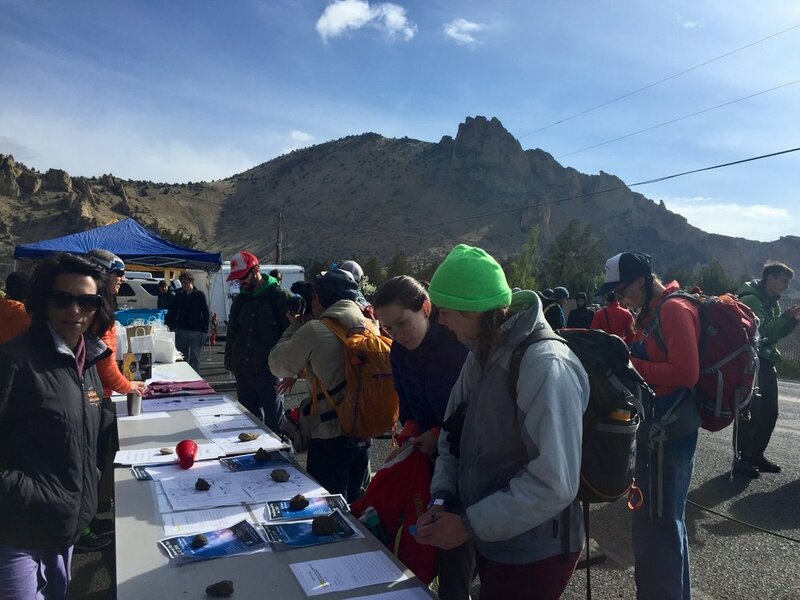 Over 250 volunteers of all ages, mostly from the rock climbing community came from local areas, but also from over the mountain passes and even other states. Their single focus? To give back to a park they love. Through early morning freezing temperatures, to baking in the sun restoring trails, hauling materials up and down steep trails, and then getting poured on from rain, they smiled and worked tirelessly in teams for hours. Out with the old, in with the new. Stairs that is. This park ranger got serious about moving dirt with one of the volunteers. Yes folks, those infamous filled up doggy bags don't decompose. Spare these guys such an odious task and take them out with you. Thank these guys and the crew below them for a much smoother way down into the park. Like we said, all ages helped out. At the end of the day everyone retreated to a barn on park management property to share stories of the day as they slacklined, did yoga, drank beer, and mingled with area sponsors in anticipation of the burrito fest that awaited. A sudden downpour sent everyone inside the barn, where they lined up as volunteers kept refilling the burrito buffet line for the hungry "Spring Thingers." Slacklining fun before the night's activities. Getting told the burritos are about to be served. Getting a cold beer even on a cool night after long hours of working certainly hits the spot. A local church group volunteered to serve up the meal. While rock climbers only make up a quarter of the annual visitation of 780,000+ visitors to Smith Rock State Park, they do the bulk of its restoration each spring, supplementing the efforts of a limited park staff. 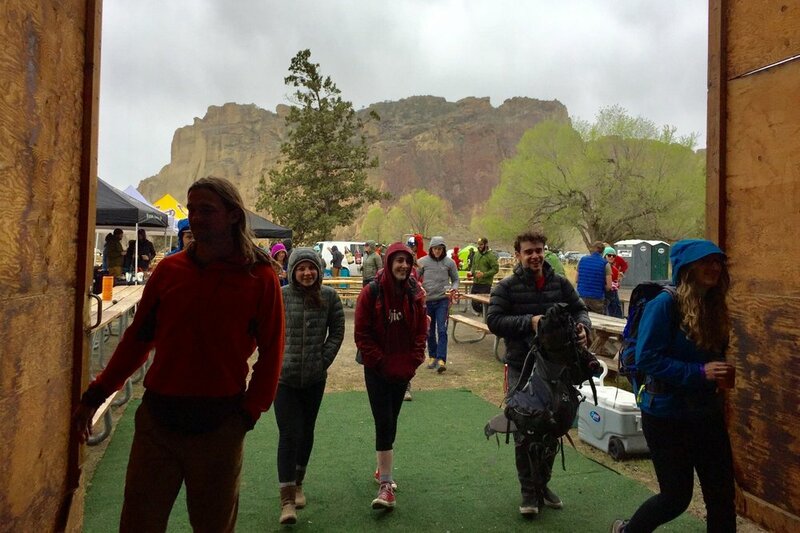 Organized each year by a small local non-profit started over 25 years ago called The Smith Rock Group (SRG), they work with park management months in advance of the event to identify projects. Each year's materials are bought and paid for by donations to SRG and money raised by raffles and auctions at the end of the day from donations from area sponsors. Following a series of announcements from the park and local volunteer organizations, the volunteers cheered as a slide show capturing the work of the day detailed their efforts.